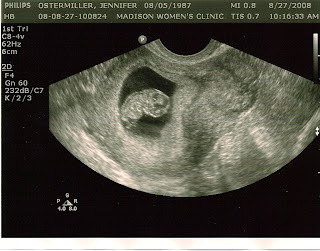 Jennie and I found out near the beginning of the month that we were pregnant. After going to the doctor this week and having our first ultrasound, we decided to make it official among friends and family. So, here's our first baby picture. When we were filling out all the paperwork that needed to be done for insurance applications, etc., we were asked to list a due date. We hadn't been to the doctor yet, and so we weren't quite sure what to put for a due date. We did some quick math and figured it would be near the end of March or beginning of April. So, we listed April 1st as the date for our baby to come. Lo and behold, the doctor told us April 1st is going to be our due date. MAN!, we're good. Congratulations!!! You'll love being parents. Be sure to keep us updated so we'll know what you're having. Bwa ha ha ! Get ready for the wild ride of your life!